Creating useful RPG developer utilities often requires you to get "under the hood" of OS/400 and work with the operating systems internals. Often, youll find yourself working with complex APIs that can consume a lot of your time just to understand, let alone fully exploit. 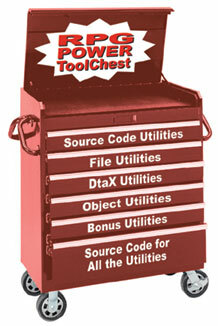 The new RPG Power ToolChest gives you fifty powerful developer utilities, complete with source code, that are guaranteed to make your job easier. These are easy to use work-a-day tools youll turn to time and again! Now youll have the tools to work smarter and more productively. for just the right tool!  Convert RPG output specifications to external printer file (PRTF) DDS specifications.  Mark RPG IV structured source statements to help you interpret the code while editing it.  Find all dependent files for a selected physical / logical file based on selected key(s).  Display Data Queue entries without disturbing the entries. Great tool for debugging an application.  Never press F9 to retrieve executed commands again! Use the ToolChest subfile command list to re-run or prompt the selected command.  Scan multiple source files for one or more strings.  Print source code lib/file/member and module information for every *PGM object in selected library.  File export utility: automatically generate an RPG program to create a comma delimited file from an input file.  This ILE utility outputs a list of procedures/fields that are exported by a service program, binding directory or module.  List all RPG and CL source members for selected physical file and all associated logical files.